Following is an essential list of line items every business owner should include in the budget for their information technology (IT) strategy. No matter what your core business is, you’ll need the right technology to sustain a successful (and profitable) business. Investing in technology is essential. Computers, servers, printers, and other hallmarks of a modern business are the tools of the modern Information Age. Business simply can’t be conducted without them. However, these overt pieces of equipment are only one component of a total IT strategy. This is where many businesses make their first critical IT mistake. They forget to budget for a comprehensive IT strategy and only earmark enough money for shiny new pieces of equipment. This is a big-budget, budgeting mistake that could end up hurting your bottom line in the long run, and it’s a problem we want to help you avoid. A comprehensive list of items to consider in any business owner’s IT budget. As you can tell, simply focusing on the first item on the list, “Hardware”, just won’t cut it. 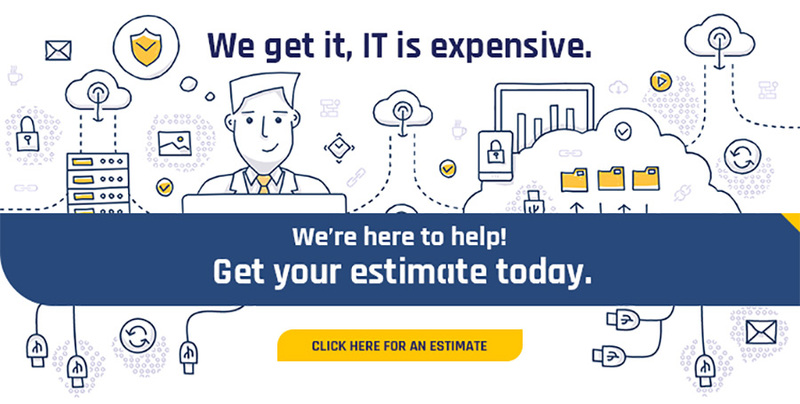 Business owners who budget only for equipment shouldn’t be surprised to find that their actual IT expenses and outlays far outstrip their initial estimates. In fact, under-budgeting for or underinvesting in IT, particularly for startups and new companies, can lead to massive problems down the line. Failing to invest in enterprise-grade software security, for example, could lead to costly hacks, loss of valuable data, or even business-breaking loss of customer trust. What Is The #1 IT Challenge Facing Your Business Going Into 2019? If you're wondering what you should be spending on IT, here’s a quick rule of thumb. Most mid-sized companies spend about 4 percent of their annual budgets on IT. That comes out to an average of between $12,000 to $14,000 per employee. Of course, these numbers will vary dramatically from business to business. Hardware, sometimes termed "capital", is what you’ll need to run your business. This can include everything from computers to printers to servers and more. Hardware includes the kind of technologies and equipment necessary to do work. While hardware and equipment may take up the lion’s share of a business’s initial outlays, don’t forget about all the wires, cables, and peripherals necessary for the hardware to function. Printers, for example, need paper and ink cartridges. Computers require a mouse and keyboard. Internet connectivity and phone connections require the installation of wiring throughout the space. You’ll want to factor in these easily overlooked items to get a full accounting of the total equipment and installation costs. Software consists of the programs and apps you need to run your hardware. For many firms, the acquisition of software, particularly profession-specific programs and enterprise software, can constitute a significant chunk of the initial IT budget along with corresponding hardware. This can include everything from a computer's operating system to word processing suites to complex network management software. Various industries will have their own software requirements. An architecture firm, for example, may need to spend tens of thousands of dollars for CAD and 3D modeling and rendering software in addition to standard office software products. Increasingly companies are moving towards the ease and convenience of cloud-based software solutions for their business needs. These cloud services, which include everything from simple file storage to complex production applications rely on a subscription-based business model. You’ll need to factor in the recurring costs of subscription services, including IT support subscriptions, into your monthly budgets. Some companies, particularly mid to large companies may hire internal IT staff to handle the day-to-day operations of network equipment and to deal with IT issues when they crop up. However, instead of wasting staff hours trying to resolve an IT problem, it will likely be more cost effective to simply outsource IT management and operations to a third-party provider like Wright Technologies. That way a company operating on a leaner IT budget can handle any IT crisis without paying full time IT staff salaries and benefits. IT overhead expenses consist of all of a company’s IT costs other than direct expenses such as hardware and software outlays. This might include insurance for expensive pieces of equipment and accident protection for computers and electronic devices. Included in IT overhead is energy consumption, and repairs and upkeep as well. Networks will crash, computers will freeze, mobile devices will be accidentally dropped on hard floors. Physical damage to hardware or corruption of software will happen - it’s inevitable. What is important is that there are sufficient repair funds available at hand so that your information technology systems and equipment can be put back online as quickly as possible. Remember, your investment in IT is to help keep your company doing work, leveraging opportunities, and generating revenue. Technology tends to become obsolete rather quickly these days. Last year’s computers and devices are often considered primitive in comparison to the hardware of today. The same rapid cycle of obsolescence also applies to software which is often updated annually. Many business owners will find that in order to stay competitive or to take advantage of the latest technological advances that they will have to be upgrading their IT equipment fairly regularly. That might mean acquiring new equipment all together or simply exchanging under-performing components for newer ones. In any case, regular upgrades will have to be made and accounted for in IT budgets. Security is an oft-overlooked but incredibly important component of a company’s IT strategy. Security breaches can often result in financial loss, government action, and loss of customer confidence. According to USA Today, 47 percent of small businesses reported that they had one attack in 2017, and 44 percent said they had two to four attacks. Perhaps shockingly, few of the companies that reported attacks acted to address their vulnerabilities or shore up their cyber defenses. In many cases, business owners simply don’t know HOW to address vulnerabilities. Be prepared to budget for and implement a cybersecurity plan that includes layers of protection, from anti-virus software and data recovery to professional network monitoring. IT is a crucial component of any business. Whether it’s day-to-day productivity, connecting with customers, launching marketing campaigns, or just tracking budgets, investing in IT is always a good idea and necessary for the success of a business. Look at IT investments as opportunities to grow your business, better compete in the marketplace, or position your company for future success. Wright Business Technologies understands how important seamless IT is. That’s why we make IT our business so that you can focus on yours! Wright Business Technologies - IT, without the hassle.